Back in February, I brewed two saisons on consecutive days with identical recipes. Both saisons received a pitch from a vigorous starter of White Labs Saison II. But for the real fun, I also pitched cultured dregs from a bottle of Fantome to one carboy, while the other got cultured dregs from some Hill Farmstead farmhouse beers, Juicy and Clara. My goal was to end up with a funky, slightly acidic saison that — unlike a full blown sour ale with a complete mix of bugs — would finish up by the summer. They did, and now that they've spent a couple months in the bottle, here are the results. (Fantome version posted here). Appearance: Pours with a light thin head; great clarity from months of settling. Straw gold, very slight touch of amber. Decent retention for the level of carbonation, which, like its sibling, is definitely too low. 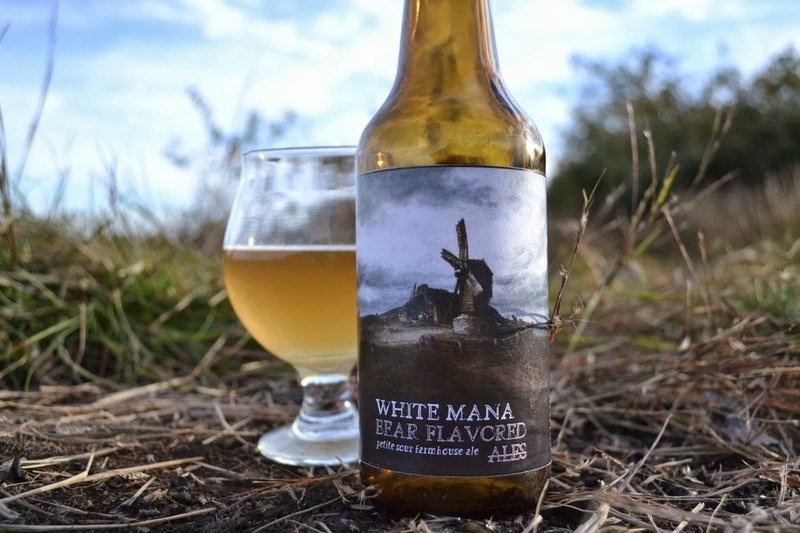 Aroma: Less aroma-focused than the Fantome version; this one has less funk and more fruit. I get a sweet floral character, and mellow fruits like grape, melon, maybe even raspberry. The Brett drops some funky dank grapefruit, reminiscent of my 100% Brett C beer. There's none of the Citra aroma left in this one. The aroma is on the fainter side, but I find it very unique and captivating. Flavor: Much more tart than the Fantome version, with firm acidity running throughout. This is what I would describe as "succulent" — just dripping with tart, sour fruit character. There's funk here, there's mild barnyard, there's maybe just a smidgeon of that saison yeast profile left. Farmhouse beer, for sure, but nothing like the saisons most American brewers are making. As the beer warms (it took about half an hour before I noticed this) and the tartness grew more 'zing', that flavor takes on an almost raspberry-ish character. Maybe it's some weird synaptic illusion created by the pairing of such juicy tartness with a mild mid-palate note of sweetness; maybe my brain is just firing its cylinders haphazardly; who knows. The tricky, slick fruitiness of this one, combined with a well-mannered sourness, makes it quite a difficult beer to describe, but also one of the most refreshingly delicious I've had in while. Some more carbonation would push that drinkability even higher. Mouthfeel: Slick, rich, very tart finish that lingers very pleasantly. If I could point to any flaw here, it's that there's not nearly enough carbonation for the style, though it's pleasant enough where it's at. I just hate seeing a saison look still after sitting for a while in my glass; knowing now that there was no chance of further fermentation and bottle bombs, I'd definitely carb much higher next time. Overall Impressions: When prepping for these batches, my main point of curiosity was the actual microbial content of Fantome and the Hill beers I'd harvested from. The Hill beers were quite aggressive in forming a pellicle, and based on the flavor profile of the original beers, I was fairly confident that contained some bacteria in addition to Brett. While I'm still relying on observational evidence, the results would seem to support this theory. This batch soured quite quickly based on my monthly tastings, and has a depth of acidity that I don't think Brett could have achieved on its own. It'll be interesting to see how these age, and if the Brett becomes any more barnyard and aromatic over time. If you couldn't tell, I really love this one. In fact, I love both versions, but the slightly amped-up sourness and acidity completely sell the Hill Farmstead version for me; it's exactly what I was hoping would come out of the experiment. So refreshing and complex, ripe with unique fruity funky; not so sour that I couldn't drink a couple pints of it back to back. It actually may be a contender for Favorite Bear Flavored Batch So Far, and already imagining a dozen fun things to use with this yeast blend in the future. Green Mana, Blue Mana, Red Mana, Black Mana, anyone? The recipe and initial notes for this batch can be found here. Ding ding ding you win! Haha mixing beer with nerd. Nice move. It's all just different types of nerdy anyway, I figure. Glad a few people actually picked up on it. Sounds fantastic. Had the pleasure of tasting Mimosa when it was originally released, and now would have killed to have harvested from the bottle. Absolutely amazing beer. Whatever combination of microflora they have in those barrels is mindblowing. Maybe someday ill be lucky enough to see another bottle here in Southern California but I doubt it (would have to trade an arm and a leg to get another bottle out here). I would love to experiment with those dregs. Love the blog, keep up the good work! 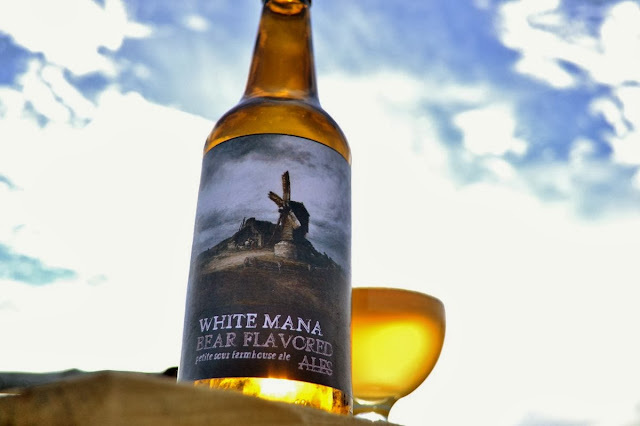 I've never actually had Mimosa, but all his sours and farmhouse ales that I have tried have been killer. I have no idea where he got those bugs, and would love to find out. One day soon I hope to find someone who can plate these dregs with me and perhaps tell me exactly what all is lurking in there! This is kinda late but I'll plate out and identify any dregs you want to send my way. Thanks for the offer Richie, that's awesome. I actually just happened to rebrew a version of this yesterday. I could send you a bottle from the old batch (I would think the critters inside should still be kicking, even a year later) or just a vial of fresher dregs. Hit me up at bearflavored [at] gmail dot com! Well if you do get it plated please let us all know! Those dregs are basically liquid gold as far as I'm concerned! I made an attempt at harvesting dregs from a bottle of supplication, but had average results in a Flanders red. Glad to hear this worked so well for you! Good luck with cultivating their dregs. I believe since 2013 (maybe earlier) they've been carbonating their saisons/funky/etc with champagne yeast. So most likely the primary yeast strains you'll be getting aren't of any value. Did you find there were definitely some HF characteristics in this and subsequent batches? As in, close to a clone of something? And what would you recommend for carbonation levels for this style? 2.8-3.0 volumes? Higher? I wouldn't call anything close to a clone, but I also wasn't trying either. Reminiscent, probably. I find that sour cultures tend to change a bit each time you brew with them, so the identity can shift a lot. I also ended up doing some blending with other strains / cultures a bit to make this more of my own thing. Yeah that sounds like a good range. I don't usually require my sours to be crazy carbed like some, but I also find they typically don't carb up to the same level a quick-turnaround Sacch beer would.